Hello Fennux Enthusiasts and welcome to the Official Guide to Getting Started with The Fennux! Please read this document carefully so that you will be able to completely understand our breedable pet game. 1.) Rez the 'Fennux Crate'. 2.) Click the crate, select 'Open Lid' from the menu that shows up and it should start emitting an orange particle circle around the crate. 3. )At this time you will hear soothing music. Please listen to it for a while. After the music starts to get annoying push 'Mute' on the menu. 4. )Make sure your orange particle circle is in land that you are able to rez items on, the crate will soon be rezzing out dens, homes, food, etc. 5.) If your orange particle circle looks fine, and is on your land you have rights to rez on, select 'Rez Homes', you should then see home(s) on the ground. 6. )Now select 'Rez Food', and it too will be on the ground. 7.) Finally select either 'Rez 1 Den' or 'Rez All Dens' to automatically rez all unbirthed Fennux Dens to the ground. 8. )Grab the HUD by clicking on 'Get HUD', after a few seconds the menu should return for you to click 'Get Hydrater' so you can obtain that as well. 9.) Grab the Redelivery Portal by clicking 'Get Portal', this will enable you to use our Fennux Self-Service Redelivery System in case something goes wrong in SL somewhere down the line. 1.) Make sure your HUD is on the "ME" Tab, and look for the top-right corner for a small set of blue arrows. These are hidden to blend in with the HUD background. 2. )Do you not see the top right corner arrows? Right click and EDIT your HUD, and move it down as far as you need to so it fits on your screen better. Once you see the arrows, stop editing the HUD and continue on to Step 3. 3. )Click either the UP or DOWN arrow at the top right corner. The white hovertext on the HUD should move up and down to be perfectly aligned. And that's all you have to do. Now you can click on Fennux, get info about them, configure them, and with a Dueling Arena - Duel them. Unlink - Unlink Fennux from the home. Breeding Off/On - Enable or disable automatic breeding of compatible, non-paired Fennux on the home. Hover Off/On - Enable or disable always-on hovertext on the home. Show Range - This displays via particle effects how big of an area the Fennux can move around within. Activity - How active the linked fennux animations will be. Access - Who can link to your home? Pack Members, The Owner, Group Members, or Everyone. Volume - How loud are your Fennux going to be?. Find Fennux - In case you are unable to locate one on the home. Range - Sets the range the linked Fennux will be able to move around in. When you are placing Fennux Homes, try clicking "Show Range" on the homes. This will show a particle that helps you determine proper placement. Make sure your Fennux are always within 20 meters of a food dish to eat from it. After your homes are setup and the Fennux which reside on them are within the range of Food, you are ready to start matching Fennux Dens up. Fennux Dens come in 2 textured variants. "Grey with Pink Highlights" and "Grey with Blue Highlights". Pink is for Female Fennux and Blue is for Male Fennux. The keyword here is "Opposites Attract". Males are breedable with Females so long as the fennux are not directly related. The only other exception to this rule is "Aggression". Look above the Fennux Den, and make sure the colored hovertext (white, yellow, or teal) is different than the colored hovertext above the matched den you are trying to pair up. If the hovertext is the same color, you do not have a "mis-match" - and you need to find another color. There are only 3 colors which match up to Aggression, Tame is Teal, Wild is Yellow, and Neutral is White. Why do we do this? There are a lot of reasons, but the main one is that It gives a ~66% chance for for compatibility, which encourages people to enter the secondary market as well as offering breeders a challenge. PLEASE MAKE SURE THAT YOUR FENNUX ARE WITHIN RANGE OF A FENNUX HOME BEFORE PROCEEDING! Click-and-Hold your Fennux Dens for 2 seconds each, then let go. A menu will show itself each time you click-and-hold. You can either turn off the hovertext from this menu, or "Give Birth" to the Fennux inside the Den. So please select "Give Birth" on the male and the female. We usually do this on all 4 pairs very fast - but that is up to you. Do you not feel like pairing up each and every Fennux? Now you don't have to with the 'Automatic Breeding' feature of Fennux Homes! All you need to do is place up to 8 compatible Fennux on a Home (Your best bet is to make sure all of the males are the same Aggression, and all of the females are opposing aggressions of the males, guaranteeing 4 offspring every 5th day), then turn 'Automatic Breeding: ON' via the menu system on the home. THIS IS IMPORTANT, make sure your home states Automatic Breeding is ON, else your unpaired Fennux will not breed. This is the easy part, pairing Fennux up. Once you pair them - they will stay paired forever, unless you separate the pairing with your Fennux HUD. 1.) Click one of the 2 Fennux you want to pair together. 2. )You should be looking at the INFO Tab, switch it to "CONFIG" Tab. 3. )Click the "Choose Mate" button. 4.) Click the other Fennux you wanted to pair the selected Fennux with. 5. )Your 2 Fennux should now be successfully paired. It's literally that simple. Keep in mind you DO NOT have to pair Fennux to breed, but if any Fennux are unpaired you must place them on a Fennux Home that has 'Automatic Breeding: ON' for them to breed. If automatic breeding is off on the home, the Fennux will not breed - unless of course they are paired. You can pair your Fennux with your friend's Fennux. All they have to do is be present with their HUD Attached, and of course their Fennux on the ground or attached to their avatar. Repeat the same process as before, but end up clicking your friend's Fennux last. It will ask them to confirm - after they press 'YES' on their HUD, the pairing will have been successful. YOU DO NOT HAVE TO KEEP BOTH FENNUX AT THE SAME LOCATION. You only need to keep the Female Fennux rezzed on the ground every 5th Day it's supposed to breed. You can keep the Fennux physically separated as long as they are eating enough Food. If one of the Fennux gets sick before the breed is supposed to occur, the breed will not occur - it's between you and your Friend to ensure your Fennux are both eating properly, but this does allow for a better breeding experience - even long distance breeding, so you and your friend can enjoy your own Fennux separately while waiting for the offspring. The owner of the Female Fennux will always get the offspring, so keep this in mind. It's the same as the above process, just click your Live Fennux, click on the 'CONFIG' Tab on the HUD, and then click 'Separate Pair'. Try clicking a Fennux, then click "CONFIG" on the HUD to bring up the CONFIG Tab. CHANGE NAME - Set the name of your Fennux for all to see. 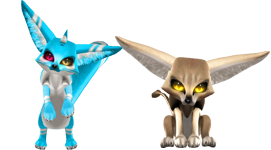 ETERNAL PET - If you have an Eternal Pet Crystal you can turn your Fennux into a pet that will last forever and no longer eat food! CHOOSE MATE - Click this, then click another Fennux to pair them up. SHOW PAIRING - Click this to visually show a pair in-world, it's very useful for double checking. SEPARATE PAIR - Click this and confirm the separation so you can re-pair Fennux. REBUILD FENNUX - Only click this if you have not first tried "RESET", this will rebuild your Fennux and cause the Fennux to eat one kibble of food. INSTANT HEAL - If you have a Healer Den, you can instantly revive your Fennux instead of waiting for it to get better on its own. ETERNAL MERGE - You can Eternal Merge your Fennux which will cause the Fennux to disappear forever but yield you all of the FNX Points it had. RESET - Press this to reset the scripts inside the Fennux, it fixes most problems instantly. UNLINK - Press this to unlink your Fennux from its last known home. There are lots of configurable options, feel free to try them all out to learn more about our product. At age 4-5 days Fennux will start to dig up recipes, at a rate of 1 recipe every 5 days approx. You will find them sparkling on the ground, semi-transparent. Make sure to click the recipes as you find them to stop the timer inside of them from causing them to self destruct. On your HUD you will get a green confirmation that the recipe is a legitimate, real upon clicking. The particles will also stop and the transparency will go away so the recipe piece turns fully opaque. Gather Part A, B, C and D of any numerical recipe - and look at the required fennux ingredients, then bring all 4 pieces of the recipe and all of the ingredients to a Crafting Machine (these will be at the Official Fennux Sim Fennux Main Store) Rez all of the required items, then click the Lever. If all goes well, you will see an animation occur, and witness your Fennux disappearing. A few seconds later an inventory offer will happen - giving you a brand new, Mystery Region Fennux Den! Dueling is simple. All you need to get started is a "Dueling Arena", a Live Fennux of some variety, and a Friend with a Live Fennux (Or an NPC Fennux). 1.) Rez out a Dueling Arena. 2.) Rez out your Live Fennux near the Arena. All you need to do is wait until you see the circle-timer counting down slowly, then press one of the 3 skill buttons to begin your attack against the opponent. (Spellcast, Claw Attack, Roll Attack) Each skill has a variable amount of damage it can do, some have a chance at doing higher damage with a chance at doing lower damage, other are more balanced and predictable. Each skill ties against itself, has a weakness against another skill, and has an advantage over another skill. Spellcast beats Claw Attack, Claw Attack beats Roll Attack, Roll attack beats Spellcast. It's a lot like 'Rock, Paper, Scissors' - so if you know how to play that, you'll know how to play this. 1. )Click the Live Fennux or Fennux Den you want to list to the Web Market. 3. )Click "Toggle Market" on the CONFIG Tab. 4. )It will ask you if you want to list this Fennux on the Market, click "YES". After that - your Fennux will be listed to the Web Market successfully. If you no longer want your Fennux listed, repeat the same process again to toggle it to be off. Alternatively, if someone purchases your Fennux it will automatically be UNLISTED from the Fennux Web Market upon purchase. 1. )Attach the "Hydrater" to your avatar, just add or wear it. 2. )Click the Live Fennux that you want to hydrate. 3. )That Fennux should now successfully be hydrated one time, click it again 24 hours from now to hydrate it a second time. If you want to disable the hydrater from operating, but want to keep it attached to your avatar, you may click the hydrater to toggle it "ON" or "OFF". Using a Hydrated Home, you are able to link up to 8 Live Fennux to it, using it just like a regular home. The only difference here is that Hydrated Homes will automatically hydrate your 8 Linked Fennux periodically. Just link them to the home, sit back and relax! :) It may take some time before the Fennux appear to be fully hydrated, this is normal, the hydrated home only needs to operate 1 time per day to successfully hydrate your (up to) 8 linked Fennux. Rezzing the "Redelivery Portal" to the ground will enable you to use the "Fennux Redelivery" feature of your My Fennux account. This item can be found within the Fennux Crate. 1.) Simply visit Fennux Redelivery, if you are not logged in - please login. 3.) Press the "Redeliver" button, and wait for the successful message to show up on your web browser. 1.) Rez out your 'Redelivery Portal' if it's not out already. 2.) Click the 'Redelivery Portal' and press 'Sync' on the menu thats shows up. 3.) Click either 'Fennux' or 'Dens' on the menu to have Fennux/Dens redelivered to you automatically. 4.) Watch as the 'Redelivery Portal' rezzes the missing Live Fennux / Fennux Dens before your eyes. Rez the crystal within range of your Fennux. Click the Fennux you want to make into an 'Eternal Pet'. Click the 'CONFIG' tab on your Fennux HUD, press 'Eternal Pet' (not to be confused with Eternal Merge!!!! ), and watch as your Fennux changes its hovertext to further confirm the operation. From now on this Fennux will not require food to keep around, but please keep in mind this will also stop it's breeding! 1.) Start feeding your Fennux again, and by day 6 it will get better (guaranteeing a loss of 1 offspring). 2.) Purchase a Healer Fennux to Instantly Heal your Fennux so it can get back to breeding ASAP. Fennux have many different coats and traits to attempt at obtaining while breeding out offspring. Max Size, Coat, Ears, Tail, Hair, Eyes, Whiskers, Aggression, and Dueling Tier are all things you can attempt for. Fennux dig up recipes over time. Make sure to click on them at least once each, this will disable their particle effects and make them fully opaque, also disabling the timer set inside of them to delete the recipe after 12-24 hours. Fennux will continue digging up recipies until it is healthy and eating food. If for some reason you feel recipes are taking up too many of your prims, look around on the third-party market for users selling recipe organizing tools. We do not offer any support for these tools - but a good number of our users have claimed them to be worth while. The one thing to keep in mind here is that an offspring is dictated to a considerable extent by the Mother and Father (parents), partly by Grand Mothers and Grand Fathers (grandparents), and a little by the Great Grand Mothers and Great Grand Fathers (great grandparents). This means that each den made has 14 Fennux helping to decide what the offspring has a chance at being. All Fennux have a potential chance to tier upward. If you breed a pair of "Tier 2" (which also has all "Tier 2" Fennux in its parents and grand parents) Fennux together, you will probably find they will produce a "Tier 2" Fennux. The only exception to this rule is if you luck out and the offspring tiers upward to "Tier 3". It is only possible for an offspring to tier downward to being a "Tier 1" Fennux if the odds favor the background information of the parents more than the parents themselves, so long as the background has some of the "Tier 1" coats lingering about. Parents always play a considerable role of what is going to come out as offspring, with chances for the grand parents and great grand parents to assist in the outcome of the offspring as well. Another aspect to consider here is, if you are mixing different tiers of coat (for example tier-1 coat and tier-4 coat) you can expect the tier-2 and tier-3 coat in the offspring as well. It's strongly advised not to use different region parents when trying to make a T2 Fennux offspring. For example: Blender + Foxy = Risky Results! However where there is risk, there can be reward. The more T2 Fennux in the background of the parent Fennux, the better. It is possible to receive a T1 offspring from a pair of T2 Fennux. It's less likely to receive a T1 Offspring if you have lots of T2 Fennux or higher in the background. If you want to breed an Amazon Region Fennux (like the Chomper), your best bet will be to put a pair of Amazon Chomper Fennux together, who have Amazon Chomper grandparents, and great grandparents. The more Amazon Chomper in the background, the better. If you put a pair of Fennux together that are both Western, but have Amazon Chomper in the background, the rule of 'parents dictating the offspring to a considerable extent' comes into play, so their best bet is going to be Western. There are ways to pair Fennux together to help pull the Amazon Chomper out from the background (especially if you know the Amazon Chomper is in the background of both Fennux), you'll just have to experiment and analyze your findings. If you want to create an offspring that has a traited Tail, Ears or Hair - you will need to make sure the Fennux parents that are making the offspring have the same type of trait somewhere in the background of the Mother and Father creating the offspring. If you want a "Wolf Tail" for instance, and your parents have no Wolf Tail present on them or their background, you will more than likely not be getting a "Wolf Tail" on your offspring. However, if the Mother and Father have unknown "Parents", unknown "Grand Parents" or even unknown "Great Grand Parents", it is still possible that a "Wolf Tail" can come out as offspring (parents, grandparents and great grandparents for starters is unknown or consider it as hidden). The best way to get a "Wolf Tail" (or any of the other tail, ears, or hair traits), would be to use Wolf Tail parents - even better chance if the grandparents and great grandparents also have wolf tail (what we call "pure" wolf tail parents). The more "Wolf Tail" in the background, the better chances you have to make more "Wolf Tail" offspring. The only exception to this rule is if you luck out and the offspring tiers upward to a next type of tail. This of course applies to Hair and Ears as well. Another aspect to consider here is if you are mixing different tiers of tails (for example "Tier 1" Tail and "Tier 4" Tail) you can expect the "Tier 2" and "Tier 3" tails in the offspring as well. Eyes and Whiskers are similar to Tail, Ears and Hair breeding - except that they do not work in uptier fashion and also these do not need the presence of a particular eye or whiskers on both parents or in their backgrounds. For instance, just the mother having Longest whisker can pass to the offspring even if Longest whisker is not there on the father or his background. So consider this as a bit more forgiving when offspring (dens) are created by a pair of Fennux. However, you have better chances at getting out the Eyes or Whiskers you want by ensuring the parents (and/or its background) both have the same Eyes or Whiskers. The better you "purify" the Fennux, the less unexpected your resulting offspring will be. Same thing with whiskers, want to get Shortest for sure on your next breed? Make sure you find Fennux that have Shortest Whiskers, and of course it helps to have grandparents and great grand parents with Shortest Whiskers as well to really lock in the favorable odds. There are plenty of Eyes and Whiskers left undiscovered thus far. There are hidden ways to pair Fennux to find new Eyes (by breeding various eyes together) and Whiskers (by breeding various whiskers together), you'll just have to try out different combinations of pairings and see if any of those are fortunate enough to find new Eyes and/or Whiskers. Size breeding is simple, based considerably on the parents (and of course grand parents, great grand parents), if you want to try and get something bigger, put Fennux together that are as big as you can find (atleast 7 or above max size). If you want to get something smaller, put Fennux together that are as small as you can find (atleast 5 or less max size). Putting Size 12 and Size 0 together will have very random results. Unlike everything else, Aggression and Eye Pupil Shape are 100% guaranteed to come out as expected. All Tame Aggression Fennux have Dilated Eye Pupil Shape, all Wild Aggression Fennux have Slit Eye Pupil Shape, and all Neutral Aggression Fennux have Neutral Eye Pupil Shape. That being said, if you pair a Tame with a Wild, you will always get Neutral - and of course Neutral Eye Pupil Shape. Whatever 2 Aggressions are paired, the offspring will always be the third, missing aggression of the parents. If you pair Tame and Neutral you'll always get Wild with Slit Eye Pupil Shape, it's actually quite simple. If you want to get a Fennux with a higher Dueling Tier (1 of 3 instead of 1 of 2), you will need to duel a compatible pair of Fennux to their Max Dueling Tier. Let's say you have a pair of Fennux and they both say '1 of 2' for their Dueling Tier. This means their Max Dueling Tier is 2 and their current Dueling Tier is 1. You must duel these Fennux up to their max, so their status shows '2 of 2' instead of '1 of 2'. Once you get them to '2 of 2', you may breed them together to most likely have more '1 of 2' offspring (instead of 1 of 1 which is more common), but they will also have a chance to have '1 of 3' offspring, meaning the max dueling tier went up. This is the only way to increase the max dueling tier of Fennux. Dueling tier of offspring depends on the current dueling tier of its parents only (not the max dueling tier). Higher is better! We have multiple methods of turning Fennux Dens / Live Fennux into more sought after Fennux. If you make use of the Wishing Well you can combine 12 Fennux Dens into 1 Limited Edition Fennux. Alternatively if you make use of the Crafting Machine you can combine between 4 and 8 Live Fennux into 1 Mystery Region Fennux, but please bare in mind that the Crafting Machine requires the breeder to discover 4 pieces of the same Recipe to begin and that the Wishing Well does not require any such Recipe. You will need to collect a full set of recipe pieces before proceeding. For example, if you have a bunch of T1 Fennux - you will be able to easily dig up Recipe 1A, Recipe 1B, Recipe 1C and Recipe 1D over time. Some pieces are more rare than others, which means you may find yourself looking around in the secondary market to find them. After you have a complete "Recipe 1A, 1B, 1C and 1D", and you have 2x Desert Coat Fennux and 2x Static Coat Fennux you may continue reading. 1.) Please visit The Fennux Sim and find an available Crafting Machine around the edge of the mountains. 3.) Click the Lever in the middle of the Crafting Machine and if all goes well it should start spinning. After a few seconds you will get an Inventory Offer. Accept it! You will now have an item in the Objects Folder of your Second Life Inventory called a "Fennux Crafting Den", you can rez this out like any other Den and birth it. The Wishing Well does not require any recipe pieces to create a Fennux, but it does require Fennux Dens. Keep in mind that you will not be able to use Live Fennux in the Wishing Well, you must use Fennux Dens. You will need to gather up any 12 Fennux Dens before proceeding. 1.) Please visit The Fennux Sim and find an available Wishing Well around the edge of the mountains. 3.) Click on the Wishing Well and after a few seconds you will be asked to press "YES" or "NO" to confirm, please click "Yes" to continue. 4.) You will get an Inventory Offer. Accept it! You will now have an item in the Objects Folder of your Second Life Inventory called a "Fennux Wishing Well Den", you can rez this out like any other Den and birth it. Visit one of our Sponsor Sims or buy your own Fennux Dueling Arena (it doesn't matter which one you buy), and rez it out at a place you have rez rights. After you arrive at a dueling arena with one of your friends who also has a Fennux (Eternal pet can duel as well), and after both of you have your Free Fennux HUDs on, please proceed. 1.) Both you and your Friend must rez your Live Fennux on the Dueling Arena. 2.) Click the Arena one time, and have your friend also click the Arena one time. 3.) Both of your HUDs should change to the Dueling tab and the Dueling should be started. After some time one of you will win the duel, or you will wind up with a tie. You may duel as often as you like with any other breeder. Visit one of our Sponsor Sims or buy your own Fennux Dueling Arena (it doesn't matter which one you buy), and rez it out at a place you have rez rights. After you arrive at a dueling arena with your Live Fennux and an NPC Fennux, and after you have your Free Fennux HUD on, please proceed. 1.) You must rez your Live Fennux and the NPC Fennux on the Dueling Arena. 2.) Click the Arena one time, wait until one of the Fennux moves into position, and then click a second time and wait again. 3. )Both Fennux should be moved into their proper positions, and your HUD should change to the Dueling tab, which starts the Duel. 4.) You must click either "Claw Attack", "Roll Attack", or "Spell Attack" (which is very similar to the game Rock, Paper, Scissors.) Repeat this by clicking one attack each round. After some time one of your Fennux will win the duel, or you will wind up with a tie. You may duel as often as you like with an NPC Fennux, and NPC Fennux never require food - similar to Eternal Pets.